Many quality publishers are navigating the “valley of death” on their migration from an advertising-funded model to one more reliant on direct reader revenue. It’s not a journey that they’ll all survive. But publishers are being driven by the realization that solely ad-funded models won’t work in the age of platform intermediaries and tech giants, which control both content distribution and advertising revenue. However, for publications with a loyal, engaged audience, the journey is worth the risk. Truth be told, it’s almost as unlikely that a solely subscription-based model will be able to support news publishers at the scale at which they currently exist. Just as the relative value of digital advertising is significantly less than print advertising, so too are most digital subscriptions worth much less per user than in print. The obvious solution, then, is to have a much more diversified revenue model, made up of a combination of advertising, ecommerce, events, and subscriptions. The dilemma for many publications – particularly digital pureplays – is that precious few people will pay to support them directly, kicking away one leg of that ideal diversified revenue model. 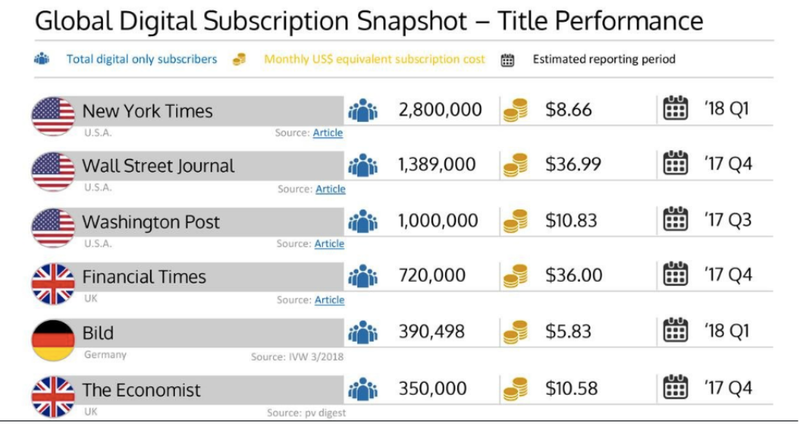 Through a combination of low propensity to pay for digital news in most countries, generic content available elsewhere, and increased competition in the direct reader revenue space, there simply isn’t enough money going around for every publication to have that stable source of income. Consequently, many publications are reappraising what their ad-funded, free-to-access properties are capable of when it comes to building additional revenue streams. Many have correctly realized that a free at point of access touchpoint with readers has advantages for launching new products (and reaching a wider consumer base) that aren’t replicable behind a paywall. Time Out group, for instance, which has kept control to an extent of the events listings that for the most part migrated to new platforms, has used its website and widely available free magazine to promote the Time Out Market in Lisbon. That space, designed to capitalise on the huge audiences who visit the site, saw revenue growth of 50% in the six months to June 30 this year. Time Out also plans to launch five new markets in North America next year, including New York, Miami, Boston, and Chicago. Similarly, in the UK the free newspaper the Evening Standard has been making a play to own the experiential space with events of its own, capitalizing on its own widespread availability as a free touchpoint in major cities to support its efforts. Despite a £10m loss this year – due in no small part to a mangled redesign spearheaded by its new editor – it’s an advantage the Standard is continuing to push by increasing its free circulation. So if free print titles are diversifying into events and experiential marketing based on having touchpoints in viable areas in the real world, how are free digital titles diversifying? They don’t, after all, have the advantage of a guaranteed audience in a specific geography, nor a controlled circulation. which all but guarantees a decent amount of advertising revenue. They’re also more exposed to the ravages of the tech giants’ push for control of ad revenue. And, while they don’t have legacy print costs to content with, content creation is costly no matter the medium. Only this month The Outline, the Joshua Topolsky-founded news and culture site, laid off its last two remaining full-time staff writers, despite a valuation of over $21m earlier in the year, for instance. For the most part, digital pureplay publications are instead launching new premium products in their vertical. Quartz, for instance, is launching its first paid-for product with its cryptocurrency newsletter Private Key. BuzzFeed, meanwhile, is taking advantage of its position to diversify further into ecommerce revenue: In his ‘9 Boxes’ memo its founder Jonah Peretti explicitly set out his vision for diversification of revenue by referencing its Tasty sub-brand, around which it has launched a raft of ecommerce propositions. Regardless of whether a free publication is in print or digital (or occasionally both), the idea that advertising will not solely sustain it has become widely accepted. As a result publishers are diversifying revenue as fast as they possibly can, given the limitations of funding and time. Whether that’s diversification using a print title to buoy events and experiential, or by launching new ecommerce propositions around a vertical in digital, the question is no longer who is diversifying, but how quickly can they own the space into which they are expanding.